Makram el Kadi, Ziad Jamaleddine, Naji Moujaes. 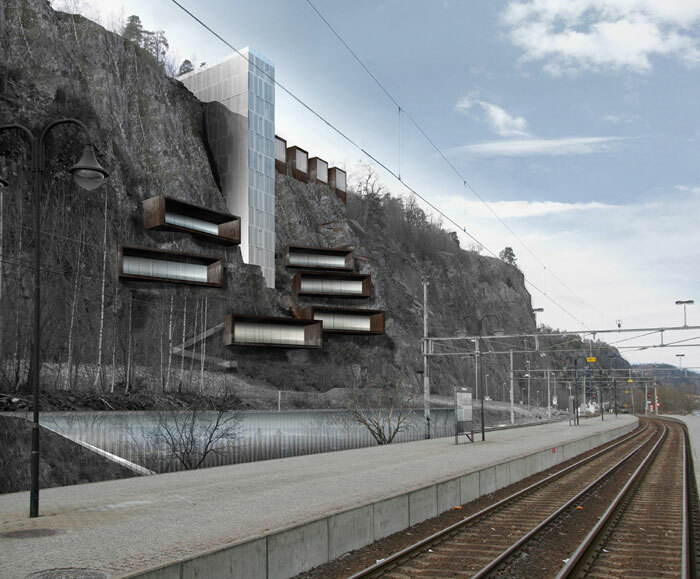 The project is located in Holmestrand, Norway, and consists of a public elevator that connects the old lower part of the town across an 85m high cliff to the newer part of it. The infrastructure acts as an articulator of multiple activities/programs that make this intervention a unique urban piece. Val de Vézère in France forms one the world’s oldest urban systems of settlement. Through almost 40 000 years a constructed geography has unfolded in the valley with the Vézère river carving out the meandering valley in the soft sandstone of the Dordogne area, creating cliffs of 50 – 100 meters with natural caves and shelves. The caves were inhabited and around them grew small villages. What turns this landscape corridor into one continuous urban system, however, is that the villages were linked by the river. The river formed a public infrastructure providing the entire valley with food, energy and transportation. In addition to this naturally given infrastructure, the cave dwellers developed a communication system. Caves located high up in the cliff walls formed excellent observation points from which one could overlook large stretches of the valley as well as send signals to other caves informing them of incoming game or warn against advancing enemies. The configuration of cliff, water and cave/tunnel, is also typical of any fjord landscape in Norway. Large parts of the Norwegian coastline are inhabited according to the same algorithm: the juxtaposition of cliff (communication node), cave (settlement) and waterfront (transportation system). In the small town of Holmestrand at the Oslo Fjord, the urban context of the cliff creates a rupture between the urban centre at its foot and the suburban population at the top of the cliff. The prime function of the project is to bridge the rupture formed by the vertical landscape. Technically this is done by means of an elevator. 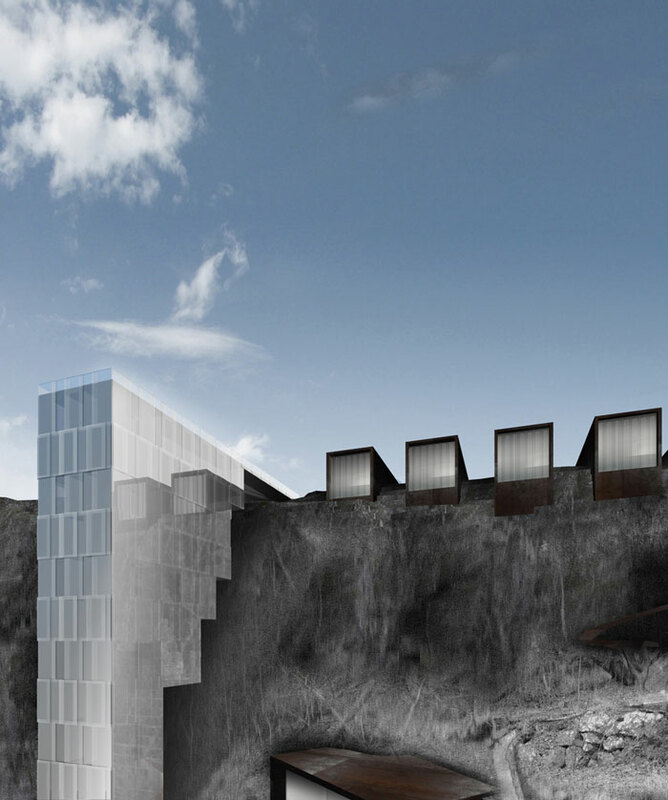 The concept is to compose a program of development by which the cliff is turned from obstacle to opportunity; using the elevator shaft as an infrastructural spine. 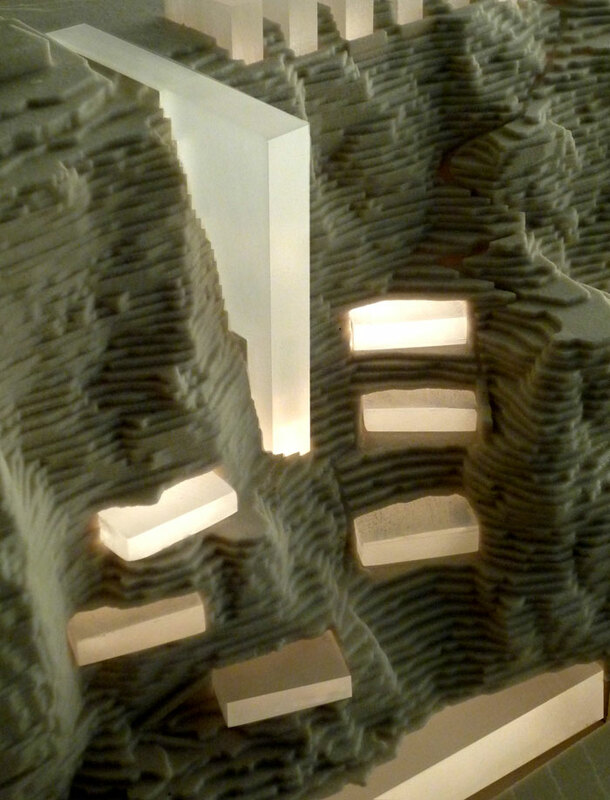 The rock itself is conceived as part of the structure, allowing the possibility of building the top floors of the development first, then the bottom floors. This constructed geography is programmed with culture- and leisure facilities together with public services, and lines the edge of the cliff with a belt of high end housing.